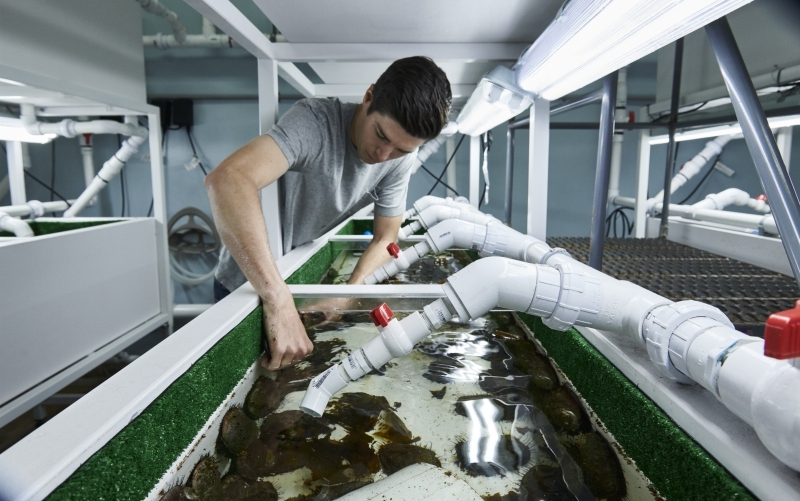 In the Bay Foundation’s two-year-old Abalone Research Laboratory on Terminal Island, abalone of varying sizes pass their days submerged in white tanks of saltwater. They look more like bewhiskered stones than snails, but when a palm-size one is removed from the water, the mollusk rises up on the muscular foot it uses to attach to surfaces and swivels defensively to the left and right. As two tiny eyes peer out from beneath the shell, short tentacles tickle the air, revealing a certain obstinate charm. “You hang out with them long enough, and then you just fall in love with them. I don’t know why,” says Heather Burdick, the foundation’s marine programs manager. The Ab Lab is part of an effort to revive the decimated abalone population in the waters of L.A. There was a time when the area teemed with abalone—not just red and green but also white, pink, black, pinto, and flat. “They used to be just stacked up on top of one another, like paving stones,” says Tom Ford, the Bay Foundation’s executive director. Prized as delicacies by Chinese and Japanese immigrants who arrived in the mid-19th century, the snails became a massive industry. Over harvesting and xenophobia led to abalone fishing being banned near the shore, but deep sea harvesting continued commercially until 1997. “Being slow and tasty is always a liability,” says Ford. A TBF species the green #abalone (Haliotis fulgens) up close and personal. . . . . . . . . . . Several abalone species including greens are estimated to be less than 1% of historic densities. Since 2013, we’ve been trying to bring these charismatic snails back to the rocky reefs of the Santa Monica Bay. The snails have yet to rebound. “Now, if we’re fortunate, we’ll find ten in a given day,” Ford adds. Withering syndrome, a bacterial disease, has killed of many, while the snails have struggled as well with warmer waters, competition from sea urchins, and the destruction of the kelp forests they feed on. White abalone as well as black are endangered, and green abalone is a species of concern. “We’re not expecting the abalone to come back on their own, because now they are too few and far between to reproduce effectively,” Ford says, explaining that the animals procreate by releasing their gametes into the sea and trusting that sperm and eggs will commingle. It’s a hit-or-miss proposition with too many misses nowadays. The foundation is experimenting with ways to get wild-caught abalone to spawn on the deck of its research vessel, but the tanks remain a centerpiece of the program. Last fall the lab, located in the Southern California Marine Institute, successfully bred its first batch of red abalone. One tank is home to about 200 of them, none bigger than a newborn human’s fingernail, that the lab’s dive team will eventually transfer to the wild among the kelp forests the Bay Foundation restored of Palos Verdes. In 2015 its divers did the same with around 900 green abalone bred by the L.A. Conservation’s Corps’ Sea Lab in Redondo Beach, marking the first time the foundation had reintroduced abalone into Southern California waters.